WASHINGTON ? ?North Korea?s latest missile launch over Japan set sirens blaring and triggered alerts telling people to seek shelter ? yet neither Tokyo nor Washington tried to shoot it down. The test follows one in August that saw another missile soar over Hokkaido. In that case, too, much-vaunted Japanese and U.S. intercept capabilities were not used. Now some in the United States are wondering why all this sophisticated weaponry isn?t being employed, especially as North Korean leader Kim Jong Un accelerates toward his goal of building a nuclear missile capable of striking the United States. ?The next time the North Koreans launch a rocket, especially one that will traverse over our ally Japan, I would hope that we shoot it down as a message to the North Koreans and to other people, like in Japan, who are counting on us,? Republican Rep. Dana Rohrabacher told lawmakers last week. ?Unless we demonstrate we?re willing to use force, there?s no reason for them to believe we will.? The U.S. Pacific Command confirmed Friday?s rocket was an intermediate-range ballistic missile (IRBM), and Seoul?s Defense Ministry said it probably traveled around 3,700 km (2,300 miles), hurtling to a maximum altitude of 770 km. The missile, which fell in the Pacific Ocean, represented North Korea?s furthest-ever flight. Evans Revere and Jonathan Pollack of the Brookings Institution wrote in a paper that Washington should declare that any future North Korean missiles toward or over U.S. or allied territory would be deemed a direct threat that would ?be addressed with the full range of U.S. and allied defensive capabilities.? The United States and Japan together claim they can shoot down incoming missiles, but officials say Friday?s siren-sounding launch didn?t meet that threshold. If the U.S. and its allies ?would have determined that it was a direct threat, we would have shot it down,? Pentagon spokesman Col. Rob Manning said, noting the military?s ?deep arsenal of capabilities.? 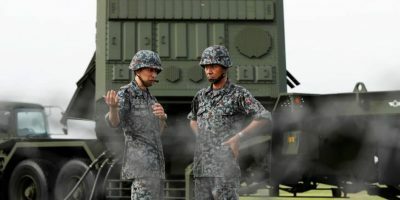 For Japan, these include Patriot Advanced Capability-3 (PAC-3)batteries, which can stop lower-altitude missiles, and SM-3 missiles it is developing with the U.S. that can take out high-flying short- to intermediate-range ballistic missiles. Also, Japan?s pacifist Constitution means any military action is limited to self-defense. Hideshi Takesada, a North Korea and defense expert who is a professor at Takushoku University in Tokyo, said that Japan plans to intercept a missile only when it enters its territorial air or objects fall onto Japanese territory. ?Therefore, the government did not issue a destruction order,? Takesada said. While Japan has decent anti-missile technology, it?s difficult to cover the entire archipelago, experts have noted. ?Also, it?s technically hard to judge if a missile flying in an early stage can actually be a direct threat to Japanese territory,? said Akira Kato, an international politics professor at J.F. Oberlin University in Tokyo. Japan and the United States do not want to risk attempting an intercept unless it poses a definite threat. A failed attempt could cause wide alarm and tip off Kim about any limitations. ?A potential failure in intercepting a missile could only result in giving an unnecessary impression that Japan?s capability of missile defense is insufficient,? Kato said. Japan also has a network of Aegis missile-defense destroyers, and U.S. President Donald Trump wants Tokyo and South Korea to increase their purchases of such U.S. gear. In Japan?s case, that could include buying a land-based version known as Aegis Ashore. According to The New York Times, the U.S. saw Friday?s missile being fueled up a day earlier. Current U.S. missile-defense technologies focus on stopping a North Korean missile when it is in midflight or during the ?terminal? stage of its ballistic arc as it plummets toward its target. But the Pentagon also wants to develop technologies to take out missiles the moment they leave the launchpad, when they are in their so-called boost phase. The U.S. military is also exploring launching cyberattacks and even the possibility of mounting lasers on drones, making them capable of shooting down ballistic missiles shortly after launch.